The pioneers now lie in trays in a hatchery north of Maupin, little more than a big eye and a yolk. But in a few weeks, once these summer steelhead eggs have hatched into tiny fry and used up the energy from the yolk, they'll be trucked to Whychus Creek downstream of Sisters and released. As they settle into the slow-moving side channels and backwaters of the creek, they will be the first steelhead to swim above Lake Billy Chinook since the Pelton Round Butte dam complex was constructed about half a century ago. 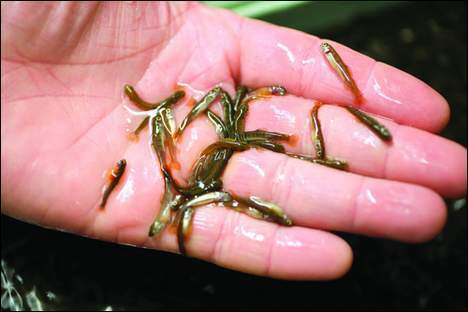 And they'll be the first test of whether more than a decade of planning by numerous agencies will enable ocean-going fish to migrate from and return to the Upper Deschutes Basin. "We're certainly really, really excited about the reintroduction on all fronts," said Steven Marx, interim Deschutes District watershed manager with the Oregon Department of Fish and Wildlife. "The big thing is it's been 50 years since waters upstream from Pelton Dam have seen summer steelhead." For the full article, please click above. Comment: this an interesting article, well worth reading in its entirety.